Simple Series Vol. 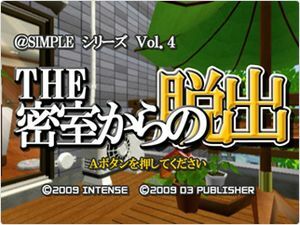 4: The Misshitsu kara no Dasshutsu (@SIMPLEシリーズ Vol.4: THE 密室からの脱出) is an escape game. Waking up from a nap on the balcony the key is in the window. It is serious, I can not return to the room! Yes, let's seek female college students living next door for help. Oh, I just wanted to go to the bathroom only at such times. Let's escape from the balcony anyway! The graph below charts the compatibility with Simple Series Vol. 4: The Misshitsu kara no Dasshutsu since Dolphin's 2.0 release, listing revisions only where a compatibility change occurred. This page was last edited on 27 January 2018, at 09:54.